Included in the New Year Honours for 2018 announced last night was the appointment of Alan Regin as a Member of the Order of the British Empire (MBE) “for services to Campanalogy and its Heritage”. Alan has been Steward of the Central Council Rolls of Honour for several years. He has worked hard to ensure that the rolls are as complete as possible, to the extent that an additional volume was required. He is also responsible for most of the photos and other additional material now forming part of the online version of the Rolls of Honour having visited many of the war cemeteries and memorials around the world where ringers are commemorated (or for some of the more distant ones, such as Port Stanley in the Falkland Islands, persuading other ringers to visit and take photographs when their trips took them nearby). During the centenary period he has organised publication in The Ringing World of monthly lists of ringing casualties for that month a century ago, and been a member of the band for many of the peal and quarter peal attempts organised to commemorate those ringers who lost their lives, including that at Putney earlier in the year (he is standing back right in the photo of the Putney peal band above). Finally, he was one of the main organisers and trustees behind the project for a ring of bells to be hung in St George’s, Ieper. Congratulations Alan on this recognition of all your work. This entry was posted in Background and tagged Alan Regin on 30/12/2017 by davidunderdown95. “This is one of the great victories of the campaign, splendidly conceived and splendidly won, a fitting occasion for the ringing of the joy-bells which have for so long been silent.” — Army and Navy Gazette, 1 December 1917, p. 1. “In spite of the great success near Cambrai, final victory is not definitely in sight, and it appears to us that the time for the ringing of joy bells has not yet arrived.” — Huddersfield Daily Examiner, 23 November 1917, p. 2. This entry was posted in Uncategorized on 20/11/2017 by davidunderdown95. Today and tomorrow bells around the country will ring, as they have done for almost a century, to mark Armistice Day and Remembrance Sunday. Ringing is usually (as in the name of this blog) halfmuffled, reflecting the mourning feel of the day. However, 99 years ago, on that first Armistice Day the ringing was (largely) joyful. Just announced is the initial news of the request for ringing for Armistice100 next year, coincidentally 11 November 2018 will be a Sunday so Armistice Day and Remembrance Sunday will actually be a single day. The request is that ringing in the morning should be as usual, but if that is halfmuffled the bells should be rung open later in the day, reflecting more of that original mood. In addition, part of the plan is to recruit 1400 new ringers over the next year to symbolically “replace” the 1400 ringers killed in the First World War and as far as possible to have them ringing on the day. 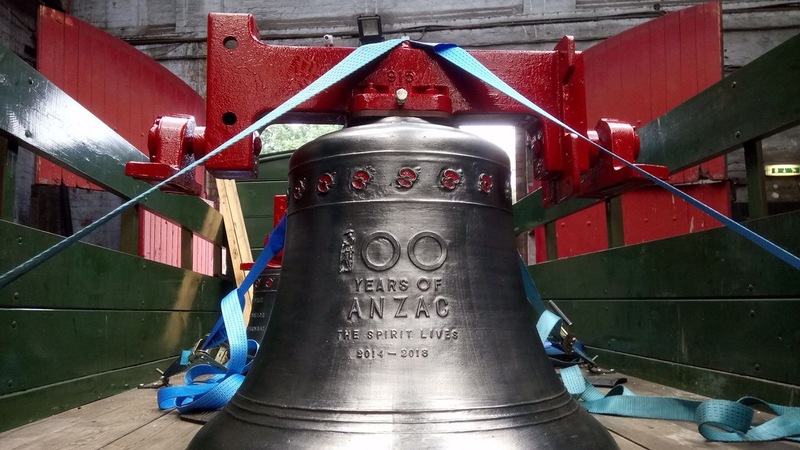 The official launch was in yesterday’s Ringing World and has now been announced on the website of the Central Council for Church Bell Ringing where details of the plans can be found. Tomorrow should also see media coverage with Alan Regin, Steward of the Rolls of Honour, talking on BBC Breakfast about some of the individual ringers killed, and pieces in some of the newspapers. Again, details are on the CCCBR website. 1918’s Ringing World shows several other stories that could easily be taken up today, for example the youngest ringer in 1918 appears to have been F C Daniels of Immanuel, Streatham (younger brother of Henry Vernon Daniels), while the oldest was 95-year-old John Heathorn of Guildford. This entry was posted in Background and tagged Armistice 100, Armistice100, Background on 11/11/2017 by davidunderdown95. For various reasons I’ve not had chance to build the profile of Ernest Hamblin yet (either here or on Lives) but I wrote a blog post a couple of years ago which set out the basic details of his life, including his emigration to New Zealand. 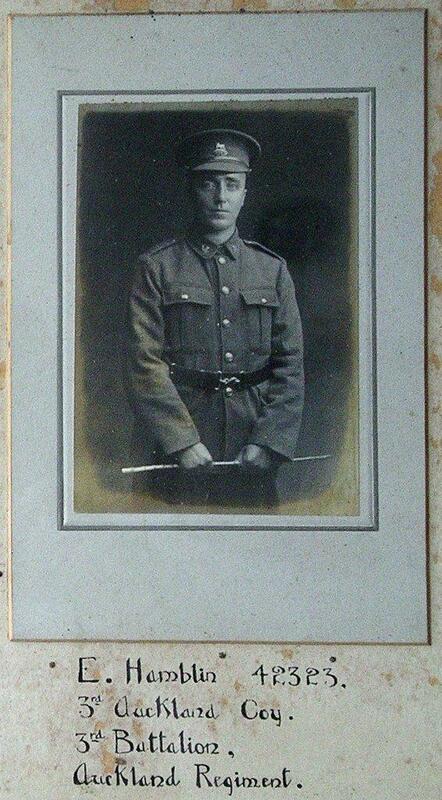 He was killed in the Battle of Broodseinde, one of the more successful actions of the the Third Battle of Ypres. The current Hersham band rang a peal midway between the centenaries of the deaths of Ernest James Hamblin and George Basil Edser (whose profile I’ve also not yet finished), on 2 September 2017. This entry was posted in Uncategorized on 04/10/2017 by davidunderdown95. 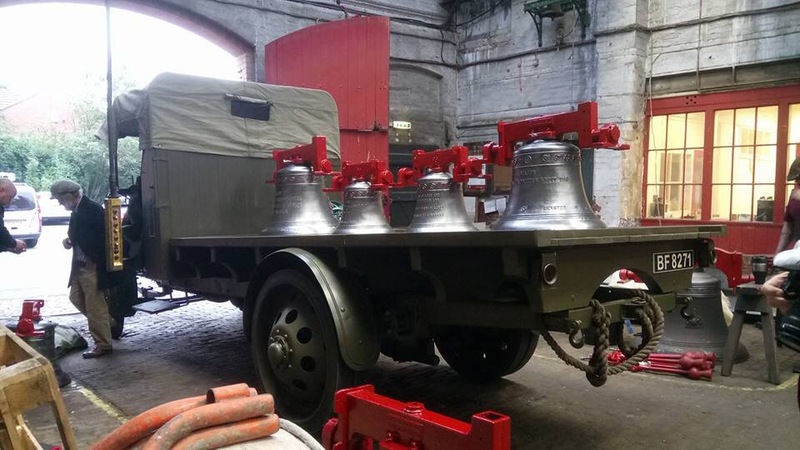 Today the bells left the foundry on the first stages of their journey to Ypres. Initially they went only as far as Queen’s Park, where they were displayed in front of the Loughborough Carillon. The carillon forms a war memorial to the men of Loughborough killed in the First World War. This included three sons of the Taylor family who owned the bell foundry. From there the bells are heading to the Great Dorset Steam Fair held over the Bank Holiday weekend. After that they will make their way to Ypres for hanging, being welcomed into the church on 31 August. The official opening will be on 22 October 2017. Details on the church’s website. One of the nice things about last Wednsday’s peal for George Honeyball was finally meeting Alan Regin, one of the trustees of this ptoject. View from inside the Foundry of the Dennis lorry ready to be driven away. Photo © Simon Westman, used by permission. 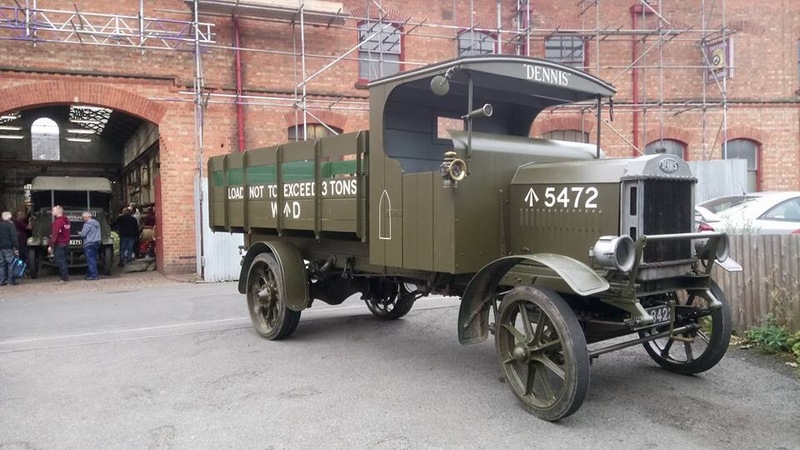 Original First World War Dennis lorry being loaded with part of the new ring of bells for St George’s Ypres at Taylor’s Bell Foundry, Loughborough. Photo © Simon Westman, used by permission. Anzac centenary bell strapped down on the back of the Dennis lorry. Photo © Simon Westman, used by permission. 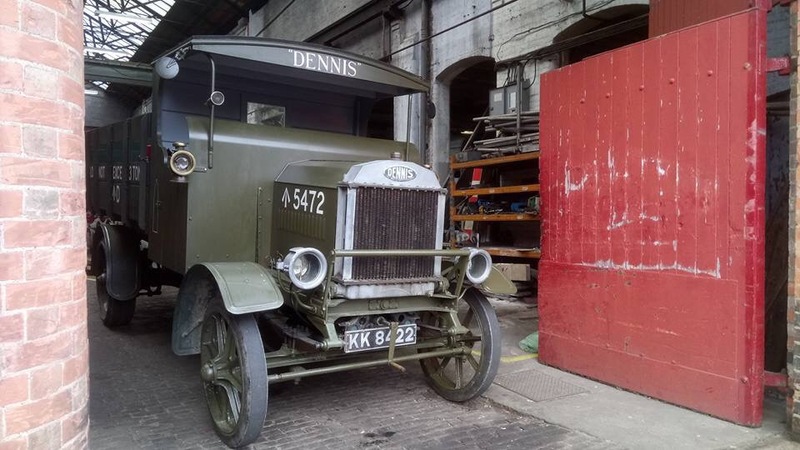 The Dennis lorry in the foreground with the Thorneycroft lorry being loaded in the background. Photo © Simon Westman, used by permission. The Thorneycroft lorry ready to move outside. Photo © Simon Westman, used by permission. 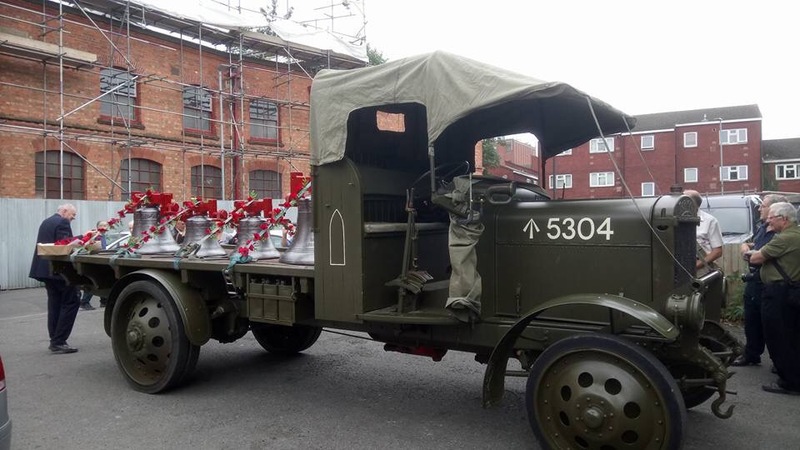 The Thorneycroft lorry ready to go, the straps holding the bells down decorated with poppies. Photo © Simon Westman, used by permission. The Dennis lorry in front of the Loughborough War Memorial Carillon. The bells of carillon commemorate men of the town killed in the First World War, including several of the Foundry family. Photo © Simon Westman, used by permission. Some more photos here on the Facebook page “Old Glory Magazine”. 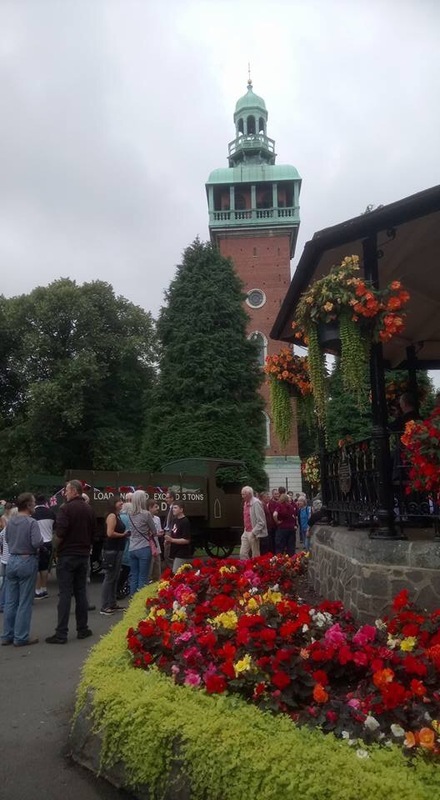 Also another Facebook post with more photos, and also some video of the lorries moving around Queen’s Park and More video from the Loughborough Echo. 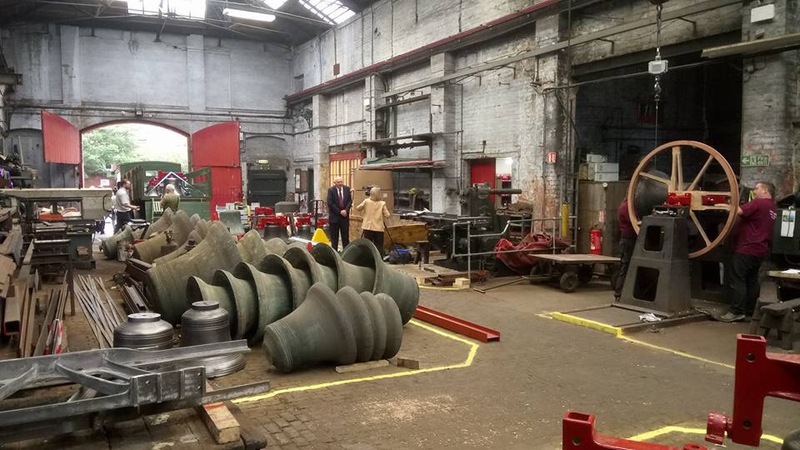 Photos of the bells’ future home, St George’s Memorial Church, and the arrival of the bells in Ieper can be found on the Keltek Trust’s Flickr album Bells for Ypres. The album also includes photos of the bells while they were at the Great Dorset Steam Fair and at the Foundry. Hopefully this Facebook post is public. It contains photos of the bells’ journey around the Ypres and also video of the set of handbells that are also part of the project being rung at various locations, including as part of the service for the dedication of the bells. Details of the ringing can be found on BellBoard. The arrival of the bells also made the local press in Belgium, Klokken van ‘t Engels kerkje gezegend and Klokken zijn thuis in ‘t Engels kerkje, as well as local television, Britse Kerkklokken in Ieper (this includes an interview with the chapalin of St George’s, in English). This entry was posted in St George's Ypres, Uncategorized and tagged St George's Ypres on 22/08/2017 by davidunderdown95. George William Waylen Honeyball (See also Lives profile) was the first child of William Honeyball and Emma Harriet (nee Waylen – her middle name sometimes appears as Harriett, and her maiden name in various forms such as Wayland and even Wallen). According to a marginal note in the baptism register of St Agnes Kennington Park he was born on 23 July 1883 and his birth was registered in the St Saviour Registration District (Southwark) in the July-September quarter 1883. He does not appear on the Surrey Association Roll of Honour, despite the Putney band having been “in Union” with the association for many years. However Putney is the home tower of the author. His parents were from the neighbouring Essex villages of Aldham and Copford, not far from Colchester. Their families were already connected as Emma’s aunt, Sarah Springett (or Springate), had married William’s uncle, Barnabas Honeyball. By 1881 Emma’s parents had moved to Ilford and were living at Mount Pleasant, Barking Lane (now Ilford Lane). 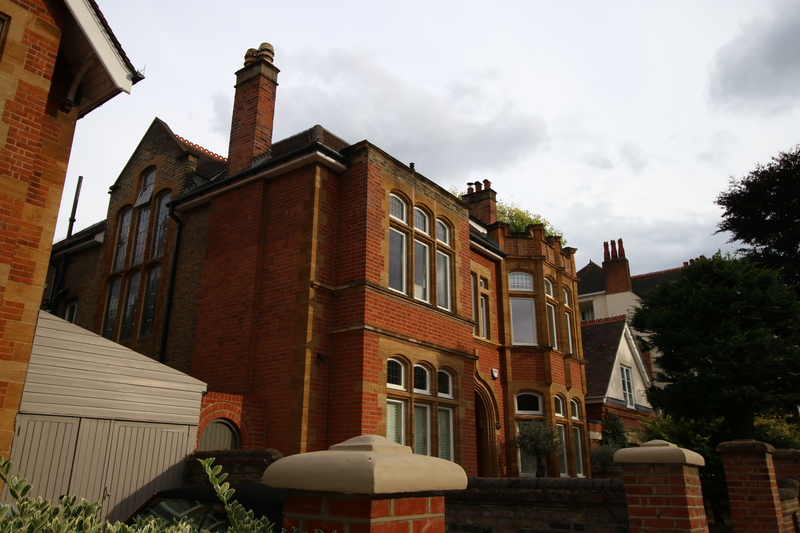 Emma herself was in service (along with her elder sister, Eliza) at 2 Harcourt Road, Penge, Croydon, Surrey, England, working for Mrs Sarah B Rainier. Similarly William had already made the move to London, in 1881 he is recorded as a lodger at 77 Farmers Road, Newington with William Courtneidge and his wife Eliza. Courtneidge was a park constable/keeper. William’s brother George would also work for the London County Council Parks’ Department. William and Emma married at St Mary’s, Great Ilford on 12 September 1882. Both gave their residence as Great Ilford at the time. William was a gardener, son of William Honeyball, labourer. Emma gave no occupation, she was the daughter of George Waylen, labourer. William signed his name, but Emma only made her mark. The witnesses were William James and Emma’s sister, Eliza. George was baptised on 30 December 1883 when the family’s address was given as 63 Farmers Road, presumably just a few doors from where William was living in 1881. 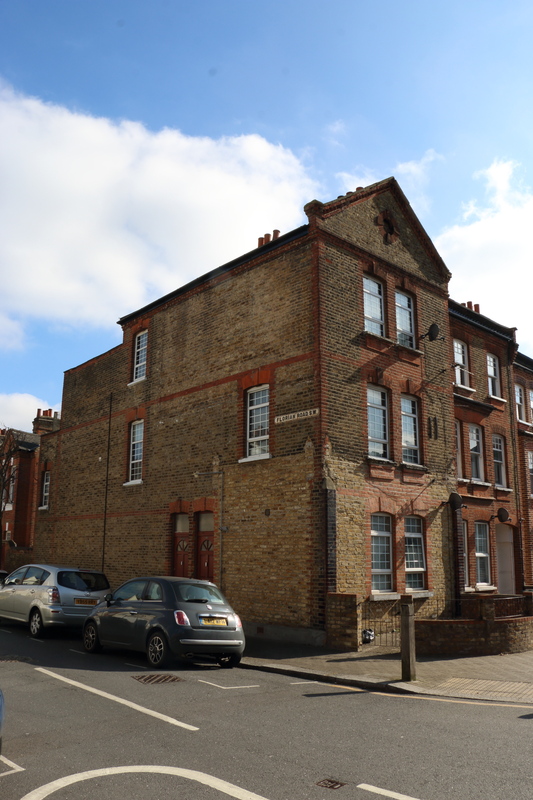 By 1891 the family were living in Putney, at 10 Upper Park Fields (the road has since been renamed and renumbered leaving this as 24 Coalecroft Road). William (36) is described as a gardener/domestic servant; Emma (34) has no occupation listed, neither does George (7, presumably he was at school). The household also contains Edward T I Honeyball (21), described as lodger, born Cheltenham, but presumably some sort of relation (although possibly there was an error by the enumerator as he’s not been traced in other records); and Peter Thomson (19), born Duddingston, Midlothian, Scotland, also a lodger. Both the lodgers are described as being gardeners at a nursery. The house was one of a group of workers’ cottages dating from the mid-19th century. At this time only the houses on the west of the road had been built, and the road itself was still amid fields and orchards, with Howard’s Lane marking the main boundary of development as shown on the Ordnance Survey map of 1893-1895 (digitised by the National Library of Scotland). A general description of the properties on the road from the Valuation Office Survey field books from about 1911-1915 states: “old-fashioned stock brick cottage. Slated roof. 2 Storey, brickwork and pointing poor. Repair poor. Gd [floor]: 1 room, kitchen, scullery, WC, bathroom. 1st: 2 bedrooms”. George may well have attended St Mary’s School, located in the nearby Charlwood Road. Unfortunately, the admission and discharge registers for the relevant period do not seem to have survived nor do the logbooks seem to mention him by name. 12 Coalecroft Road, originally 4 Upper Park Fields, in 2017. The family home of the Honeyballs from about 1893 to 1914. Electoral registers suggest that the family had moved just up the road to 4 Upper Park Fields by the time Ellen Elsie Waylen Honeyball was born on 3 August 1894. The field books note that 4, 5 and 6 have no bathroom. It was owned by their neighbour at 3 Upper Park Fields (later 10 Upper Park Fields), J Dulley, a builder. The final page of the Valuation Office field book indicates that the house was sold on 4 July 1920 for £150. Land Registry data shows that the house last sold in late 2015 for just under £1.5 million (the estate agent’s details show it does now have a bathroom!). In 1901 the family were still at 4 Upper Park Fields (now 12 Coalecroft Road). William (46) is still a domestic gardener, Emma (44) has no occupation listed, George (17) is a coal order clerk and Ellen (6) is presumably at school. Also in the household is their lodger, Leon Jaquet (20) a market gardener from Switzerland. The character of Putney was now rapidly changing. The fields around Upper Park Fields were now disappearing under houses. 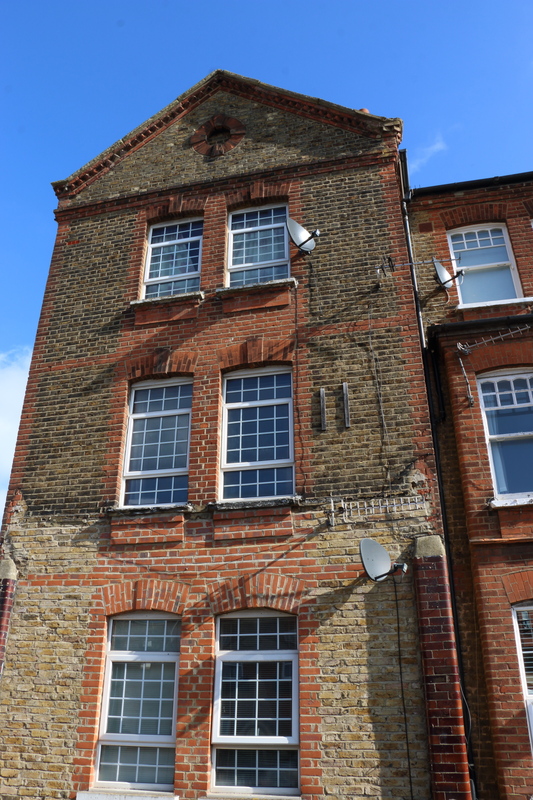 The houses on the eastern side of the street seem to have been completed by around 1904, at which point the numbering was changed to the usual odds and evens, with 4 becoming 12 (there were a couple of previously unnumbered houses toward the junction with Howard’s Lane). In 1911, the family were still at what was now number 12 Upper Park Fields. William was still a gardener. George is described as a coal merchant’s clerk, and Ellen as a domestic nurse. It seems that with both children earning there was no longer any need to take in lodgers. It’s not clear who George was working for, but postal directories show two coal merchants based in small offices at Putney Station, Edwin A Cornwall, and Stratton, Gentry & Co Ltd.
It’s not clear exactly when George learnt to ring, the first report in the ringing newspapers that mentions him is of a quarter peal of Grandsire Triples rung on 24 September 1911 for Sunday service, and to mark the birthday of two of the band, T Bolton (the tower captain) and C F W Hunt (the conductor). Hunt and Skevington (also ringing) are more frequently associated with Hammersmith, and it seems they may have been teaching the band. This quarter peal is not marked as George’s first, so there is probably an earlier one that is proving elusive. Next both George and his father William rang in another quarter peal of Grandsire Triples to mark the wedding of the Revd Laurence Rawdon Levett (the curate of Putney) to Mary E Patchett on 7 November 1911. This was the first quarter peal to be rung entirely by regular ringers at St Mary’s. Then, on Christmas Eve, George himself conducted a quarter peal of Grandsire Triples before a service, this was also the first quarter peal for S Jones. 1912 started in similar vein with quarter peals of Grandsire on Wednesday 7 February (only William was in this one rather than George) and Sunday 11 February (with both father and son). Then, on Monday 8 April, the band rang the first peal by Putney ringers (other peals had been rung at the church previously by visiting ringers). The method was again Grandsire Triples, this was the first peal for both George and William. After that there was a bit of a lull until September when the local band rang another quarter peal of Grandsire for the wedding of the vicar’s (the Revd Canon Thurston Rivington) son, Reginald Thurston Rivington, to Nora Sedgwick. The wedding actually took place in Sherborn, Warwickshire, where Nora’s father was vicar. Canon Rivington had previously been vicar in two parishes in Warwick. Then for Harvest Festival on 22 September they branched out with a quarter peal of Plain Bob Major, a first for George and William and several others in the band. They finished 1912 with service touches of Stedman (with George ringing) and Bob Major (with William) on 22 December for evening service. 1913’s ringing really got going in March with another quarter of Bob Major on the evening of Easter Day (23 March), and again on 5 April (for a wedding). On 3 June George conducted another quarter peal of Grandsire, followed by another for service on 20 July which marked his birthday and that of his father. The dedication for this quarter also shows that William was secretary for the band. On Wednesday 30 July both were again in the band for a quarter of Bob Major for a wedding. On 12 October George again conducted Grandsire Triples with his father in the band. Then on 26 October both rang Bob Major again. On 9 November George rang the treble to a quarter peal of Stedman Triples, this is marked as the first in method for C Collis jun and H Whanslaw, but not for George, so again it seems at least one quarter peal is proving elusive. 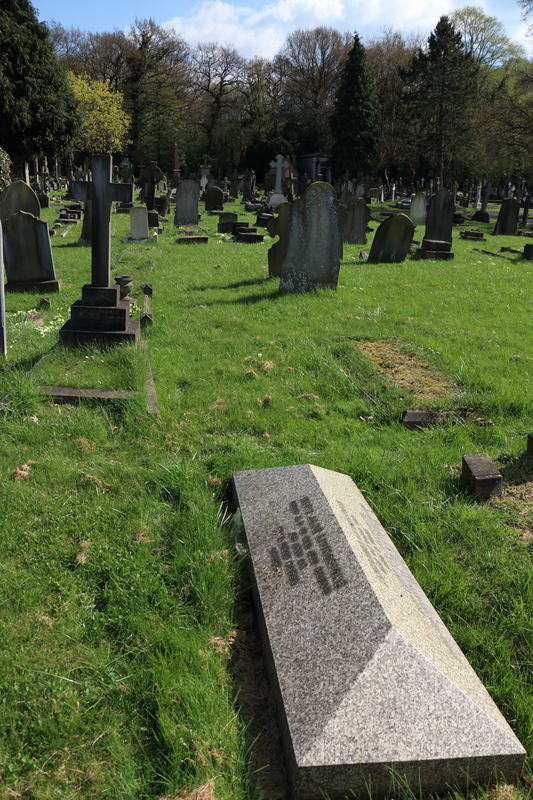 Sadly Emma Harriett Honeyball died in early 1914, and was buried in Putney Vale Cemetery on 21 January 1914. Cemetery records show she was buried in Plot D2, Grave 215. It is listed as a “Class H” burial, not in “general ground” but a cemetery visit in 2017 showed no sign of headstone or other marker. She died (at home) at 12 Upper Parkfields. Emma Harriett Honeyball (nee Waylen) was buried in Putney Vale Cemetery on 21 January 1914. There is no grave marker, the grave is in the second row of graves visible in the photo, to the right of the grave with a cross on three steps, directly in line with the granite topped grave in the foreground. The first reported ringing in 1914 was a second peal on 13 April, this time conducted by Alfred Jones on his first attempt at conducting a peal. It was this peal that was marked by a peal board in the ringing room, sadly destroyed by the fire in the church in 1973. On 6 May both George and William rang in a quarter peal of Bob Major. This appears to be the last time father and son rang together. On 26 July George rang a quarter peal of Kent Treble Bob, his first in the method (and also that of 3 others in the band). 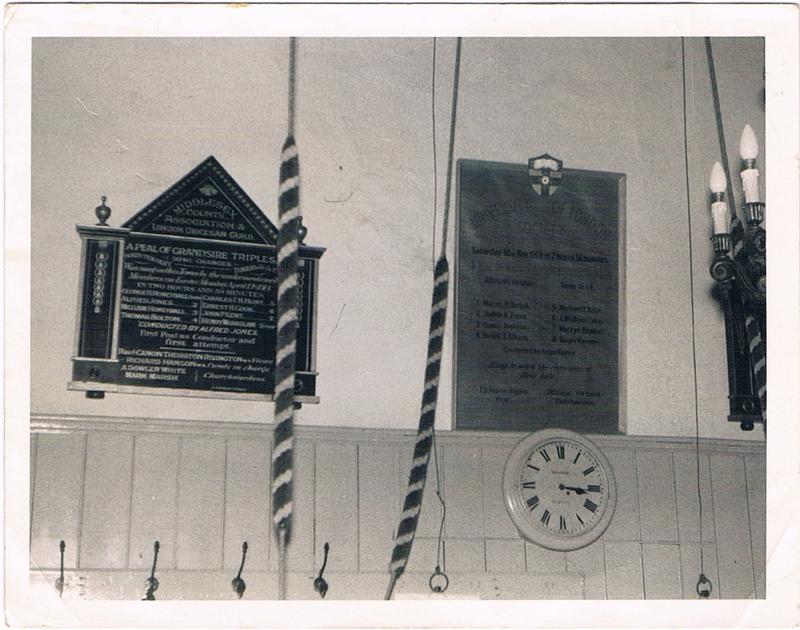 Photo of peal boards in the ringing chamber at St Mary’s Putney prior to the fire in 1973. The board on the left bears the names of George Honeyball and his father William and marks the 1914 peal rung by the local band. The last known ringing by George was on 11 April 1915 when he rang two courses of Double Norwich Major for Sunday service. The influence of the war is perhaps visible in the very mixed group of ringers, F I Hairs usually associated with Clapham, though he was stationed at Roehampton with the Royal Naval Air Service, Elsie Bennett (who would later become Mrs Hairs – they would be the first couple to ring a peal on their wedding day), Sedley Collins of Fulham, and C J Matthews of St Martin in the Fields (though resident in Southfields and later reported as a Putney ringer when he joined up underage later in 1915). The exterior of Walpole St Peter church, where George Honeyball and Bessie Julia Naylor married on 6 July 1915. 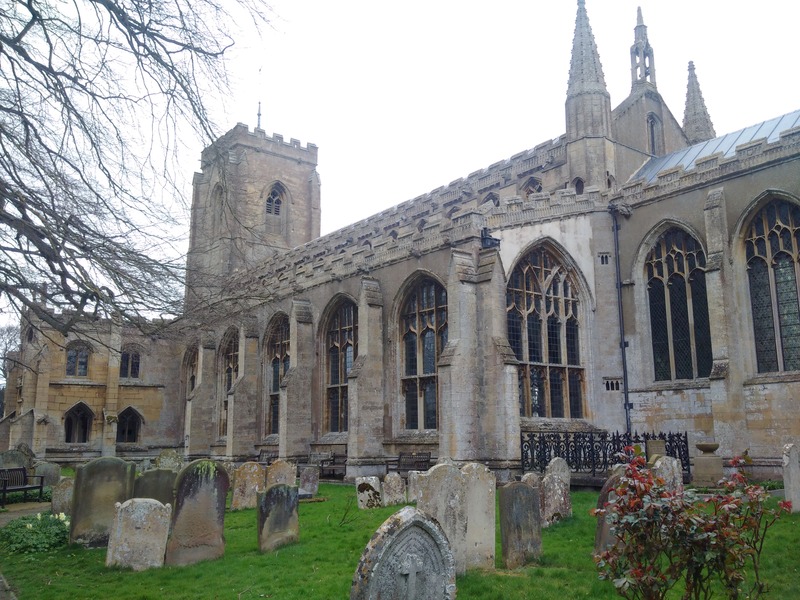 On 5 July 1915 George married Bessie Julia Naylor in the magnificent parish church at Walpole St Peter (registered in the Wisbech Registration District). 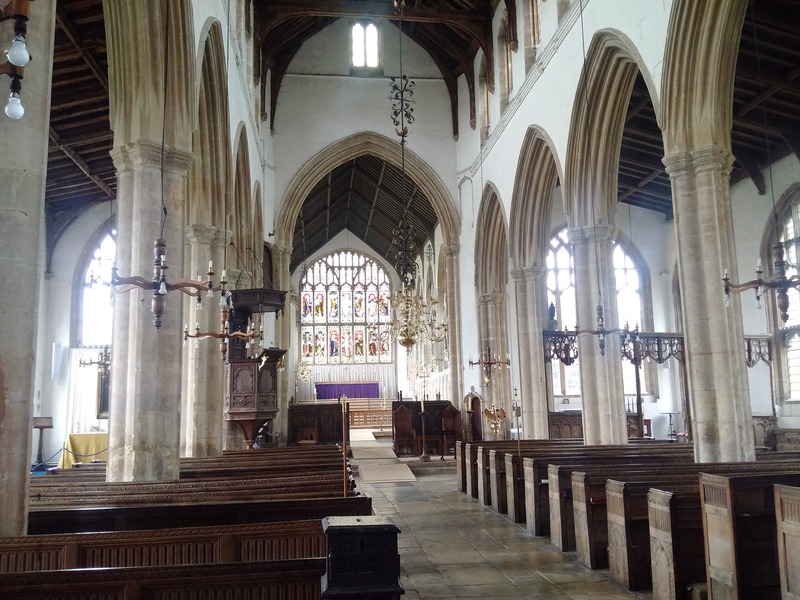 Parish records show that the banns were called at St Mary’s Putney on 13, 20 and 27 June, and show that the bride was from the parish of Walpole, Norfolk. The only Bessie Naylor recorded in the Wisbech district in the 1911 census was already 61. However, following the family back to the 1901 census shows a Julia Naylor in this household in Lynn Road, Walpole Highway, Norfolk, part of the parish of Walpole St Peter. In 1901 the family consisted of William (55), a carpenter, born Methwold, Norfolk; Bessie (50), born Exeter; and their daughters Julia (19); and Victoria (13), both born Walpole St Peter. Presumably Julia’s first name was also Bessie, but as her mother was called the same she used her middle name. By 1911, the younger daughter is recorded as Mildred, rather than Victoria, again presumably a case of using a middle name. Searching for Julia Naylor finds her working as a housemaid at 11 Briar Walk, Putney – just a few roads away from the Honeyballs in Upper Park Fields. Head of the household is Mary Blanche Alton (59), a widow with private means, born Norwich; also present are her daughter, Kathleen Mary Leonore Alton (30), single, born Putney; Mary’s half-sister Hannah Atkins (74), born Barnham Broom, Norwich; and Agnes Broomer (age unknown), cook, born Westcott, Surrey. The Valuation Office records show that the houses in Briar Walk were on a rather different scale to Upper Park Fields. Although George’s service record did not survive the Blitz in the Second World War (like so many), it turns out that in the case of the 31st Regimental District which included the East Surrey Regiment, and covered Putney, the recruitment registers still survive. Honeyball is listed, and the register shows that he attested on 7 December 1916 at Wandsworth. He was then 32 Years and 6 months old, weighed 120 lbs, was 5 foot 4 inches tall, with a 35 inch chest, which expanded by 3 inches. He was in call-up category 38 (this was determined by age and marital status), and medically he was rated A2 (fully fit, but untrained). The remarks column contains the address 148 Putney Bridge Road, presumably where he was living at the time he attested. He was initially posted to 3rd (Special Reserve) Battalion, this functioned as a training battalion and was based in Dover. The recruitment book does not show the regimental number, only a recruitment reference. View of the front of 148 Putney Bridge Road in 2017. This was where George Honeyball was living with his wife, Bessie Julia (nee Naylor) when he was called up in late 1916. The ground floor was originally a shop, traces of the shop front can still be seen after its conversion to an entirely residential building around 2003. 148 Putney Bridge Road in 2017, showing the front and side elevations. The infill replacing the original shop front is more obvious from this angle. The Commonwealth War Graves Commission records show that his number with the Royal Inniskilling Fusiliers was 41167 which allows us to identify his medal index card, which shows he was Private 31333, East Surrey Regiment, and Private 41167 Royal Inniskilling Fusiliers; and the associated medal rolls detailed by the index card as “B/102 B27 page 11462”, now in WO 329/1133. These show he served with 9th (Service) Battalion, East Surreys and 7 Battalion Royal Inniskilling Fusiliers, unfortunately no further details are given on the index card or in the roll as to his dates of service or transfer between units. The war diaries of the 9th East Surreys are quite detailed, often giving complete summaries of men killed and wounded each month, but Honeyball does not seem to be mentioned by name. Nor is there any mention of men being transferred to the Inniskillings. However, further examination of the medal roll shows a number of men with similar Inniskillings service numbers with prior service in the East Surreys, suggesting that a number of men were transferred at the same time. Service records of some of these men do survive, and suggest that Honeyball probably completed his training in mid-March and he was posted to 9th East Surreys, but after arrival at a Base Depot in France he was transferred to the Inniskilling, being posted to 7th Royal Inniskilling Fusiliers around 26 March 1917, and probably actually joining the battalion on 9 April. Their war diary shows drafts joining on 11 and 16 April. The first few weeks with the battalion were spent largely in training behind the lines. Then in early May George received his first taste of front line service. On 9 May the battalion was due to be relieved but the German’s opened a heavy bombardment at the time the relief was due to take place. They were eventually able to extricate themselves by 2 am. At 2 am on 29 May there was a gas alarm, but fortunately it proved to be false. From 6-14 June the battalion took part in the highly successful Battle of Messines, 16th (Irish) Division (of which the battalion was part) captured Wytschaete. The remainder of June, and most of July was spent refitting and training. They moved back towards the front at the start of August, taking up positions at Square Farm on 6 August. On 8 August they suffered a heavy German bombardment. They moved out of the line on the night of 10/11 August, before returning to Square Farm on 14 August, ready to attack as part of the Battle of Langemarck on 16 August. It was during that attack that George Honeyball was killed, somewhere in the area between Square Farm where they started, and Hill 37, or a little further east, which was the furthest point reached. They were forced to retire as the divisions either side had not progressed as well, leaving their flanks exposed. After the war George Honeyball was remembered on a variety of memorials. In Putney itself he is on the roll of honour in St Mary’s Church which accompanies the cross outside. 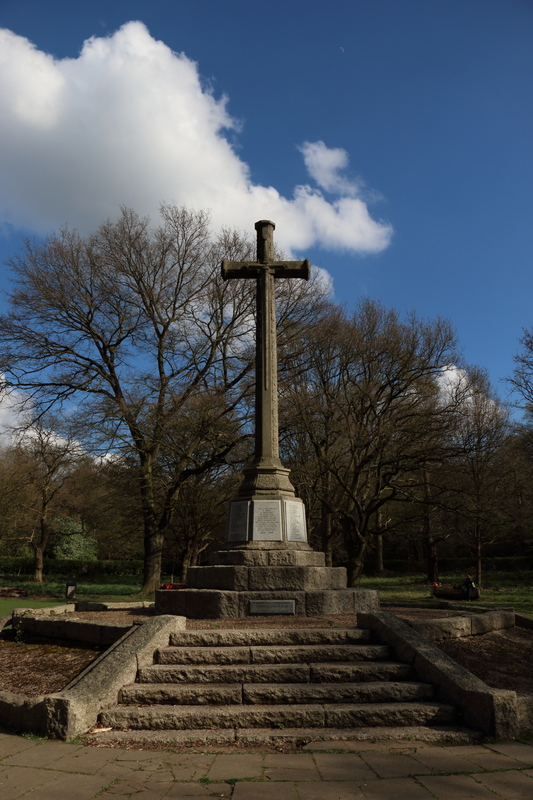 A memorial was also erected on an extension to Wimbledon Common that was bought by public subscription after the war. It was presumably due to his wife, and perhaps the ringers, that he was included on these memorials. 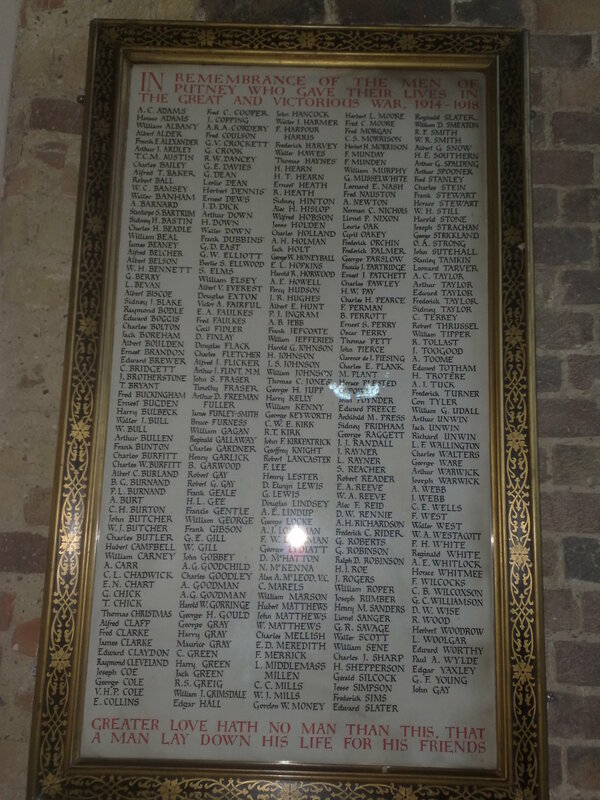 A general view of the roll of honour inside the church at Putney, this complements the memorial outside which does not have any names on. George Honeyball is named in the middle column, about one third of the way down. 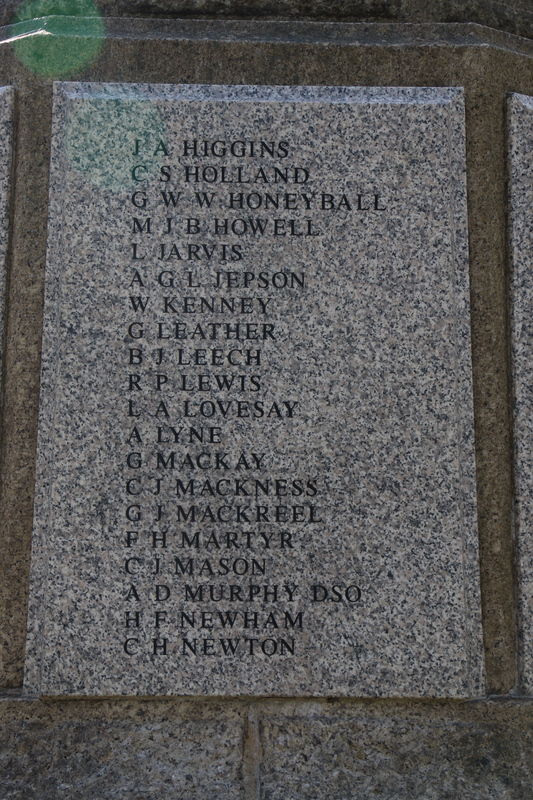 Third from the top of this panel on the war memorial which stands on the Richardson Evans Memorial Playing Fields on Wimbledon Common is G W W Honeyball. The memorial lists men from Putney and Wimbledon who were killed in the First World War. His father and sister also ensured he was on the Aldham War Memorial. On that memorial there are also two of his cousins, a second cousin, and a son of Elsie Honeyball’s first husband (who was much older than her) by his first marriage. The Central Council for Church Bell Ringers also set up its own roll of honour, now held in the bell tower at St Paul’s Cathedral, and in 1919 there was a series of services around the country on 22 February to commemorate the ringers killed. The service for London was held at St Clement Danes and George Honeyball was among the list of 80 ringers read during the service who had been killed in the war. He was also included on the Tyne Cot Memorial to the Missing opened in 1927. This lists those killed on or after 16 August 1917 in the Ypres area who have no known grave. He may also be commemorated in 1914-18 Book of Remembrance held in the East Surrey Regimental Chapel (Holy Trinity Chapel) in All Saints’ Kingston. Bessie Honeyball continued to live in London, by 1939 she was living in Effie Place, Fulham, and her occupation is given as “Unpaid Domestic Duties” (she was presumably living on her widow’s pension). The 1939 Register (prepared as the Second World War started to assist in the distribution of ration cards etc) also shows her surname crossed through, and replaced with that of Rule. Marriage indices record the marriage of Alfred Stephen Rule and Bessie J Honeyball in the first quarter of 1945 in the Chelsea registration district. Stephen was a recent widow himself, in the 1939 Register he and his wife Laura were living on Trott Street, Battersea. Stephen (who was born in Australia) had served in the RFC and RAF during the First World War, his skills as a tailor and sailmaker probably having been put to use preparing the fabric used to cover the wings of early aircraft. Elsie continued to run the Queen’s Head in Aldham for many years. She married twice and had two children. The centenary was marked with a peal, and a display at the base of the tower. The display will remain in place until the end of August. Details of the peal of 5056 Yorkshire Surprise Major are on BellBoard. The band who rang the commemorative peal at Putney on 16 August 2017. This entry was posted in East Surrey, Other towers, Putney, Royal Inniskilling Fusiliers and tagged Aldham, Battle of Langemarck, George William Waylen Honeyball, Putney, Royal Inniskilling Fusiliers on 16/08/2017 by davidunderdown95. A follow up to my original post about the installation of a ring in Ypres. The bells have now been cast, as described in a local newspaper report. They will be on display, in their frame as part of a foundry open day at John Taylor & Co, Loughborough on Saturday 29 July 2017 10.30 – 17.00. After that the frame will be disassembled and everything will be transported to Ieper. My understanding is that the bells are expected to be ringing in time for Remembrance Sunday this year. This entry was posted in Uncategorized on 24/06/2017 by davidunderdown95.